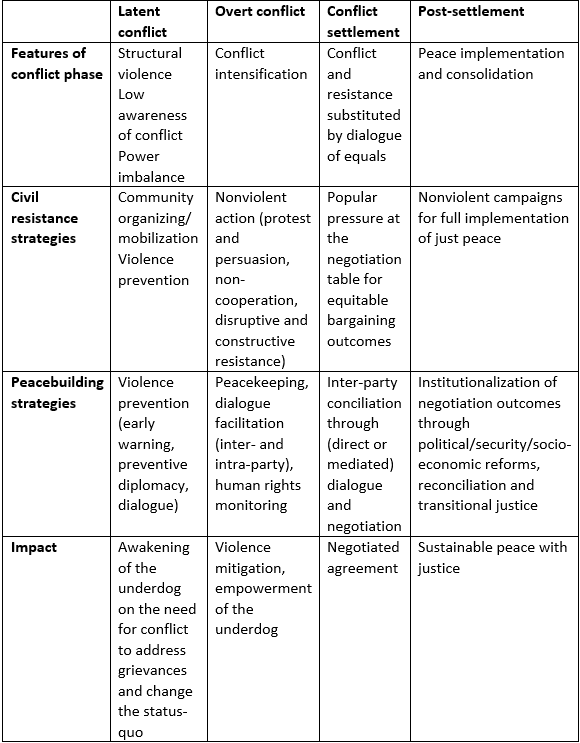 These case studies are expected to refer to the analytical framework developed by Veronique Dudouet in the ICNC Special Report “Powering to Peace: Integrated Civil Resistance and Peacebuilding Strategies” (see Table 1 below) and to provide illustrative and specific examples from conflict events to demonstrate how civil resistance and peacebuilding strategies worked together or separately in four identified phases of violent conflict: latent; overt; settlement and post-settlement. The proposal submission deadline is October 15th, 2017. Prospective applicants are strongly encouraged to review the ICNC Special Report “Powering to Peace” before submitting their proposals. ICNC aims to commission up to five case studies depending on the relevance and strength of the submitted proposals. Burkina Faso’s mass based civilian mobilization against a long-term dictatorship in 2014 and later against the military junta. 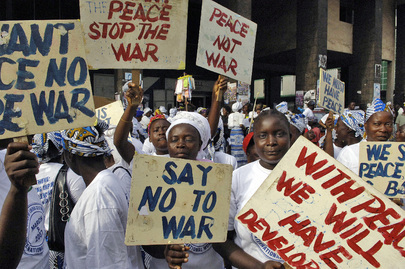 We also welcome proposals for an in-depth analysis of other cases of conflicts in which civil resistance and peacebuilding strategies might have played a role. We will consider single-author proposals, but our preference is for jointly-submitted (by at least two authors) proposals, in which the authors complement each other’s scholarly expertise with field or practitioner-informed experience. Case studies should include practical applications of strategies of peacebuilding and civil resistance in resolving, transforming or containing a violent conflict. Proposals should be submitted online and are not to be longer than 1,200 words. References, tables, footnotes and appendices do not count against this word limit. Please do not send complete papers. the selected case study looks into a single, country-specific conflict (rather than conflicts across countries) in a defined time frame and identifies various stages in which a conflict developed and different domestic actors that devised and deployed peacebuilding and civil resistance strategies to address and mitigate violence. Support by external parties for domestic actors and their peacebuilding and civil resistance strategies can also be evaluated. ICNC offers a $2,000 honorarium for completed multi-authored publications and $1,000 for completed single authored publications. Table 1: Conflict transformation strategies: A comprehensive staged approach. Source: Veronique Dudouet, “Powering to Peace: Integrated Civil Resistance and Peacebuilding Strategies,” ICNC Special Report, 2017, p. 31.